Estadias de curta duração aceites a partir de 2 noites. Esta casa de férias adorável para 6/7 pessoas, com 3 quartos, 1 equipado com uma TV com Play Station 2 com jogos de todas as idades e DVD player para crianças, 3 casas de banho com chuveiros e WC para um Máxima privacidade, cozinha americana e sala de estar, tudo em uma decoração elegante e aconchegante, e embora no centro da cidade com todas as lojas, você encontrará um lugar calmo e relaxante. Todas as janelas dos quartos estão no sul e não se negligenciam nenhuma estrada, você será os vizinhos por alguns dias da última casa de Leonardo da Vinci 'Clos Lucé', onde muitas vezes recebeu a visita de seu amigo, rei François 1er . O Gite está localizado na rua mais visitada de Amboise (na maior parte do tráfego de pedestres), na verdade, liga o Clos Lucé ao Castelo, no caminho você pode parar para olhar para as casas trogloditas ainda habitadas hoje. Você também pode tomar caminhos de pedestres que passam ao pé da casa de campo e a rota do Loire à Vélo. Amboise é o ponto focal para a visita dos castelos do Loire: Chenonceaux, Chambord, Cheverny, Blois, Chaumont e seus fabulosos jardins, Ussé (Castelo da Bela Adormecida), e muitos mais .... Para descobrir! Você também pode restaurar com especialidades Touraine em um dos muitos restaurantes da cidade a 5 minutos a pé da casa e desfrutar da tranquilidade dos vinhos do Loire produzidos em nossa região. E então, visite os vinicultores que visitarão suas adegas e provarão sua produção. Lovely home and beautiful town! The home is lovely and as described in the photos and written comments. The property is very close to the castles and town center- just a quick walk to the right or left. There are many cafes, restaurants and bakeries serving lovely meals and delicious desserts. The surrounding area in the Loire Valley including the castles are best reached by car or a tour. Amboise does have a small train station that is an easy walk without heavy luggage. I highly recommend this accommodation and town. Renovated with character and charm. This renovated home with original beams and fireplace captured the flavor of a city built in the 1500’s. The cottage retained its heritage after extensive renovation with modern kitchen and bathrooms. It was charmingly designed, very clean and located within walking distance of the historic castle and city center...a gem. Surtout merci , votre hébergement nous a tous ravi , douillet, propre, joliment aménagé, silencieux et surtout très bien situé, à deux pas du Clos-Lucé et cinq du château. Nous y reviendrons pour continuer notre périple des Châteaux. Maman 90 ans a dormi dans la chambre du haut, tout est encore possible. Characterful and charming in a fantastic location. The house was beautifully restored and so quirky with lots of lovely little touches which made it both homely and totally individual. We were 2 adults and 2 teenagers so the property worked very well for us with the teenagers taking charge of the lower floor and leaving us the privacy and peace of the top floor. The location was absolutely perfect enabling us to walk, cycle or canoe wherever we wanted to go.So nice not having to drive everywhere. Amboise is delightful with a fabulous mixture of culture and activities, and of course, wine tasting! A perfect house in a perfect place! Exactly what we were expecting. Perfect! Alexa is so helpful. Our family stayed in Alexandra's home for 3 nights in July. We found it to be perfect for our needs. There was plenty of room for us all (my husband and myself, our 2 teen children, and my brother) and space to all be together or have privacy. 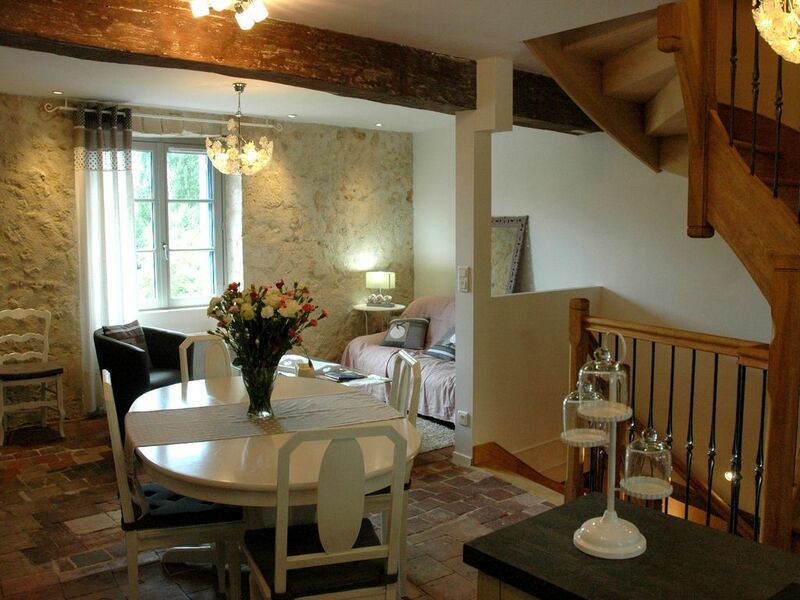 The home is located a short walk from the center of Amboise and just a hundred meters from Chateau du Clos Luce. While there was some foot traffic outside during the day, the nights were very quiet. Alex was easy to work with before arrival and was a wonderful host and showed us everything we needed to know about the home. The pictures are accurate and the home is very clean and pleasant. The kitchen is well appointed and the beds are comfortable. Plenty of towels were provided and we had everything we needed. There is a large clothes washer and separate dryer in the kitchen area and the 3 showers all had plenty of hot water and good flow (even when used at the same time). The upstairs bedroom has an en-suite separate toilet and room with shower and sink. The two bedrooms on the bottom level have 2 bathrooms, each with toilet, sink and shower, in the hallway between the rooms. As mentioned in other reviews, this is a 3 story home with curving stairs and some low beams in the ceiling. We had no problem with this and loved the charm of the exposed "cave" walls. The home stayed fairly cool even in the heat of day and there were fans in every bedroom (thank you, Alex!). We left the windows open at night and it was wonderfully cool and quiet. We had a car and were able to park in the free lot a short walk down the street. We loved our time in Amboise and only wish we could have stayed longer. We also had some excellent dinners right down the street at Chez Bruno, Restaurant L'Epicerie (be sure to get the escargot), and L Florentine. I recommend Alexandra's home without reservation for your Loire Valley stay.